Books and stories have always played an important role in my life. One of my early memories is a battle of wills with a librarian over how many Asterix books I could take out. Policy said only three at a time, but I wanted them all. Later when I became a librarian I understood the policy was designed to ration a limited resource. That was the small-town library in Taupo (pop. 12,000 in 60s & 70s) where I grew up. Before we left I had discovered science-fiction and began checking out Asimov and Arthur C Clark books. We had a small book case at home with books collected mostly by my mother, since my father was unable to read well (I think he had what we'd call dyslexia these days). Some of those books became companions and guides. I recall libraries in all the places where I've lived. The magnificent Wellington City Library with it's curving glass wall and matching curved shelving. The first cafe in a library in New Zealand I think. The ugly functionality, but massive size of the Auckland City Library. For a few years I had keys to the stacks of ACL as a result of my job and I would explore the catacombs. I discovered unbroken runs of Popular Electronics and built circuits based on designs from them. There was a complete set of Max Müller's Sacred Books of the East series gathering dust in a gloomy corner. Libraries in Taupo, Hamilton, Northcote, and Glenfield too. School libraries, university libraries (Waikato, Auckland, Victoria, AUT, Unitec), and private libraries too. I owned very few books until I was in my late 20s. Books were expensive and anyway, Libraries made owning them unnecessary. I spent my money on buying records. Then I discovered second-hand books and the Hard to Find Bookshop (but that's another story). One of the important libraries I got to know was at Waikato University where I studied chemistry in the mid 1980s for four years. This was a large purpose-built university library on 4 floors with views overlooking the extensive grounds of the campus. Chemistry was on the fourth floor. They use Library of Congress call numbers, so science was Q and chemistry was QD. I got to know the QDs pretty well. But I did other sciences as well so the whole Q section was where I spent most of my time. 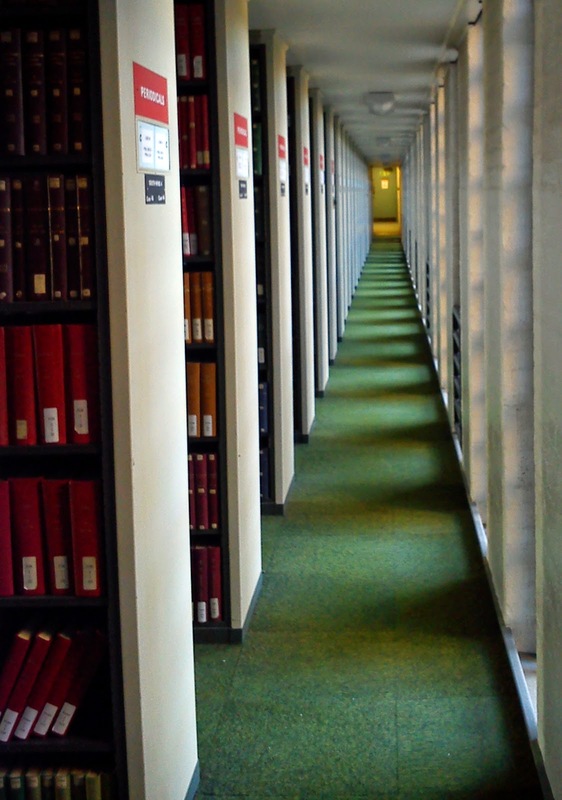 However some days I would stop off at the 2nd or 3rd floor and just wander amongst the stacks. Trailing through sections on sociology or literature, marvelling at the titles of the books. Trying to imagine the scope of the knowledge that the books represented. All that knowledge! I was spell bound. My first job in a library was at what was then the Auckland College of Education, now absorbed into the University of Auckland. I was lucky to get the job in many ways. My forays into rock 'n' roll were not paying the bills and I was bored. I'd been out of work long enough to qualify for a subsidised placement and my boss was canny enough to take advantage of that while giving the job I applied for to someone else. The staff there were all educated, urbane, friendly and talkative. They talked about literature in such a way that for the first time in my life I wanted to read it. I started on Nobel Prize winners, reading Hemingway, Steinbeck, Updike. I got into John Irving and D H Lawrence. I even read James Joyce. I've read his Ulysses, but prefer the original. Importantly I learned about being a librarian and liked it enough to go to Victoria University in Wellington in 1991 for a post-graduate Librarianship course. In the process I did a research project using citation analysis on the New Zealand Library Journal that became my first academic publication. My main finding was that the local librarians were influenced by reading the New Zealand Library Journal. I did research in and around the Victoria University library and learned about writing essays (something I'd never done much of). I learned to type my essays on a computer. And in 1991, two years before the world-wide-web launched, I created my first hypertext document. Most of my professional life was spent in engineering libraries. I became more of an information consultant, a specialist in database searches and document supply. My favourite thing was identifying a book for an engineer that was precisely what he needed and the only thing like it, finding it in a library in Canada, checking the online catalogue (this was 1995 so it was one of the very first online library catalogues that was web-searchable), and requesting the book be sent to us in NZ. A week later we got it. I also recognised the potential for the WWW to save libraries money (a feature of my approach to online information). I gave up working in libraries in 2002 to come to Britain and immerse myself full-time in a Buddhist life style. But one of the first things I did was join the local public library (which is rather small and disappointing considering where it is). 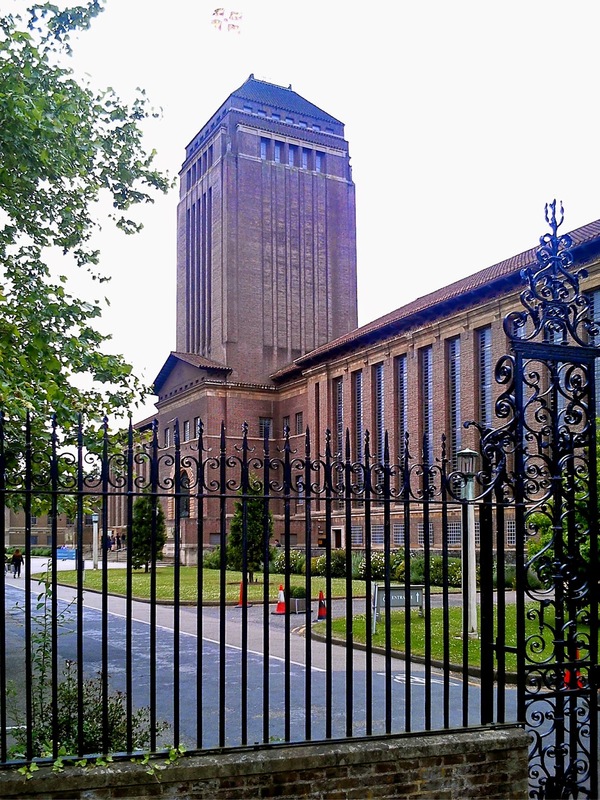 I got my readers card for the Cambridge University library about 2006. A Triratna Order colleague is a fellow of Trinity College and kindly wrote a recommendation. It costs very little and gives me access to all the collections, including electronic and to some extent manuscripts. The "UL" as everyone calls it was built in the 1920s. It's probably what you'd call "monumental". With a large tower over the entrance way and a forbidding exterior. The inside seems to be modelled on a monastery - with central courtyards and wings surrounding them. The UL has the oddest filing system I've ever come across. Books are filed in order first of decreasing size (a,b, c or d); then by a broad subject based on a home grown system (Buddhism is 2:3-2:5); then by acquisition order, with a number indicating century and decade, then a running number. So all the middle-sized books on Buddhism are together at one end of the south wing, 3rd floor, but from the point of view of browsing they are randomly jumbled together: one gets Tibetan Tantra, followed by a meditation manual, a history of Buddhism in Sri Lanka, a treatise on Pureland Buddhism all next to each other. The atmosphere inside is also monastic. Quiet industry. Scholars working behind piles of books. I feel the incessant tapping of computer keys detracts somewhat, but I might just be jealous of the wafer-thin laptops that scholars here all seem to have. 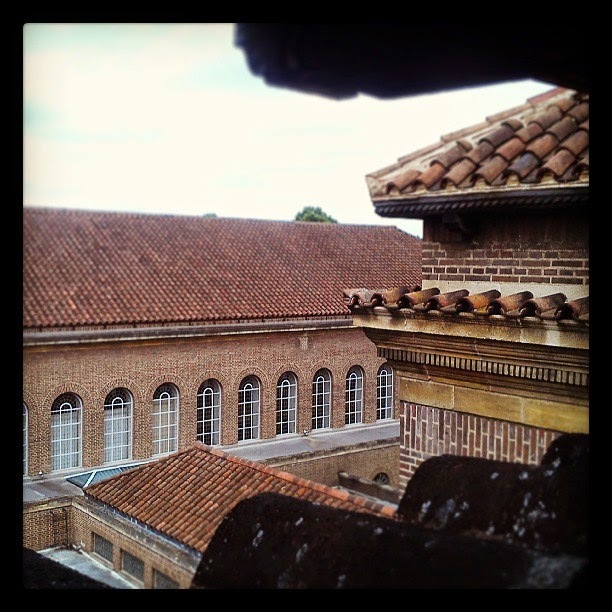 Because the central spaces are courtyards and the books and study spaces are distributed around the edges of a large building, one can walk a very long way during a day at the library. Going from Buddhism, to where the Sanskrit books are, to the nearest photocopier is about 200m of walking and four levels of stairs! The internal architecture is a weird mix of 1920s art-deco based utilitarian and at times rococo decoration with carved wooden panels. Mostly the former. It's pre-brutalism fortunately, but still quite stark in places. The sixth-floor North Front wing has nothing much going for it - a concrete bunker with books. And yet closer to the entrance way there is light and space and attention to detail, along with art exhibitions. Here I have access to the literature of Buddhism in manuscript form, and published in many languages. The Tripiṭaka can be found in Pāḷi (three versions), Tibetan (two versions) and Chinese (only the Peking ed.) Published editions of Indian literature from the beginnings of Western engagement with it, and editions of ancient texts in Sanskrit and other Indic languages are comprehensively collected. Secondary literature is held in a separate area, but is also fairly comprehensive, despite the demise of Buddhist studies at Cambridge. Being a legal deposit library one of book published in the UK must be deposited there. I also have access to the entire range of their electronic collections of databases and article aggregators like JSTOR. As a professional librarian I was often involved in discussions about the role of the library in the age of computers. In my last library job I managed projects that shifted our reliance from print and CD based indexes and sources to web-based products. I negotiated with, or translated for, suppliers, IT staff, senior management and Librarians. The UL makes full use of all these electronic resources. In the mean time many journals of free to read online (though let's not forget that someone pays to host them, they are not free). Google Books is becoming an increasingly useful tool for finding info in books - even books I already own. Scanned articles and books abound, though they are of dubious legality. And many scholars either maintain an online bibliography (e.g. Michael Witzel, Bhikkhu Anālayo, Richard Gombrich) or they upload their work to academia.edu (Jan Nattier, Harry Falk, Geoffrey Samuel). But despite all the wizardry I still need to visit the library from time to time. Sometimes I leave with burning eyes and running nose from the paper dust having handled some book that has mouldered on the shelf for decades. Very often what I want is in storage and must be retrieved by a library assistant (this is a consequence of the demise of Buddhist studies). But the service is efficient and seldom takes more than half an hour. There are not many libraries in the world that are so well funded, so comprehensive and so accessible. The UL is a place I can go to commune with the many scholars on whose shoulders I stand. And if I want to read the original Robin Dunbar article on neo-cortex size correlations with group size I can just get it off the shelf (I have done). 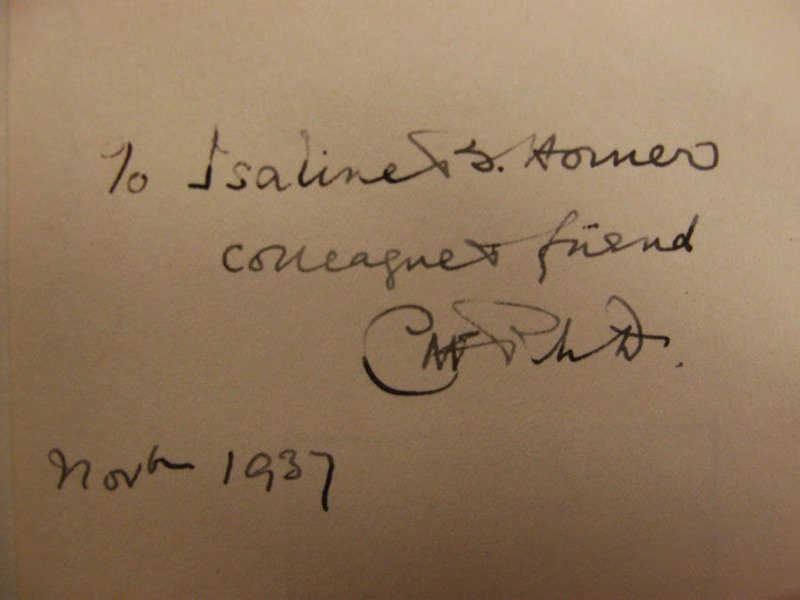 Sometimes I come across little gems: books previously owned by I B Horner or books signed by Edward Conze or C.A.F. Rhys Davids (reminding us that Cambridge was once an important centre for Buddhist studies who's star has faded). I may not be a member of the university, but I know that I belong there. I may not be a world-class scholar with a lifetime of achievement and honours, but I am part of that milieu. My few publications are a contribution to the quest for knowledge to which the UL is both monument and cathedral.